I see him twice within a twenty-four hour period of time. Each time, healing waters flow. You might call me a crybaby. Mea culpa. But he has been a strong presence in my life. 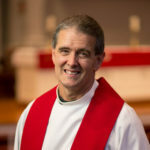 I’ve served with him on committees; I struggled with Bible stories with him; I’ve worked with him in his role as our Council president; I’ve argued with him over Sunday hymns he thought were unsingable; I’ve sat with him in the hospital; I’ve had the privilege of bring communion to him; I have learned from him; I have admired him; I have laughed with him … and now I have cried with him. I’m kind of an old fashioned guy. So I am not always comfortable with the tears that sometimes sneak past my eyelids. I know it’s OK in our world … men are supposed to be more comfortable with their raw emotions. But I’m still embarrassed by my public tears. I cry a fair amount in the movie theater. Listening to “This is Me” sung by Barnum’s “oddities” in The Greatest Showman gets me every time. Seeing the looks on the faces of the Von Trapp children as their dad comes in from the patio to sing “The Hills are Alive” with them, slays me. But in public I feel a bit awkward. However … having said that … I was grateful for the tears that blessed my life this past weekend. They were healing waters. They allowed me to honor this man I admired and appreciated. They allowed me to connect with him emotionally, even though in life he tended to be more rational and objective. They gave voice to my grief and love for him, when my words deserted me. Healing waters. The phrase brings to mind the Sacrament of Holy Baptism … it brings to mind the springs of Lourdes … it brings to mind a hospital sponge bath offered to the woman who has been buried in tubes and tape for the better part of a week in an ICU unit. Healing waters. In your prayer life this week, think about those places where tears become healing waters for you … those places where your raw emotion lances a spiritual sore whose infection has poisoned you … those places where your hurt in the moment leads to healing in the days ahead … those places where watery sorrow leads to the sunlit … or Son-lit … warmth of hope. And as you revel in the glow of that warmth, say a little prayer of commendation for Earl. Indeed. Bless you and thank you, Judy.